Made from Premium Quality Sheesham Wood (Indian Rosewood). Size: 24″ X 14″ X 36″ in inches.Manufacturing Usually Takes 2-3 weeks. 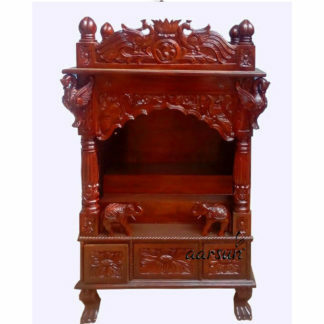 Aarsun Woods brings to you this handmade Wooden Mandir / Pooja Ghar suitable for homes and offices. 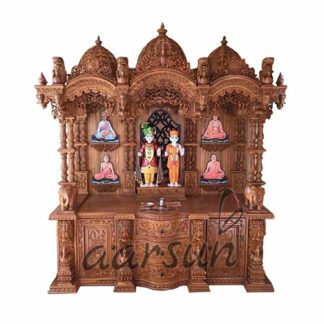 the mandir is made from Premium Quality Sheesham Wood with traditional carving and finishing. The mandir is in Sheesham Wood except for the base where idols are to be placed and the ceiling where dome is placed which is in premium quality plywood. These Indian Wood Mandir are used and appreciated for worships as well as interior decorations. They are very modern and made of the wood. 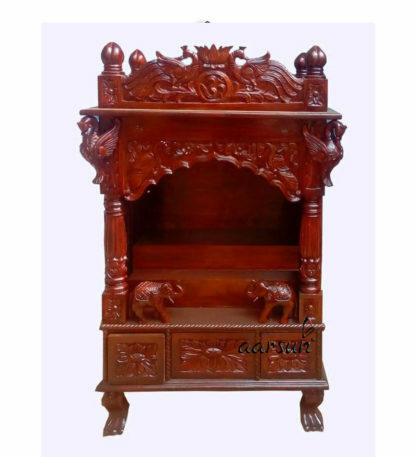 The unit is made carefully keeping in mind all the usual requirements of a customer.The Mandir is made from Sheesham Wood which is famous for its long lasting durablity and have its own spritual significance. We provide a wide range of designs in Wooden mandir that can be customized as per your requirement. Contact us for a different Size.